Mourning doves (Zenaida macruora) are common birds of both urban and suburban areas. Attracting them to your yard is easy and doesn't require any special equipment. Essentially, by offering doves an easy food source, protection from predators and places to roost, they will often visit your yard. If you're lucky, they may even build a nest and produce offspring. 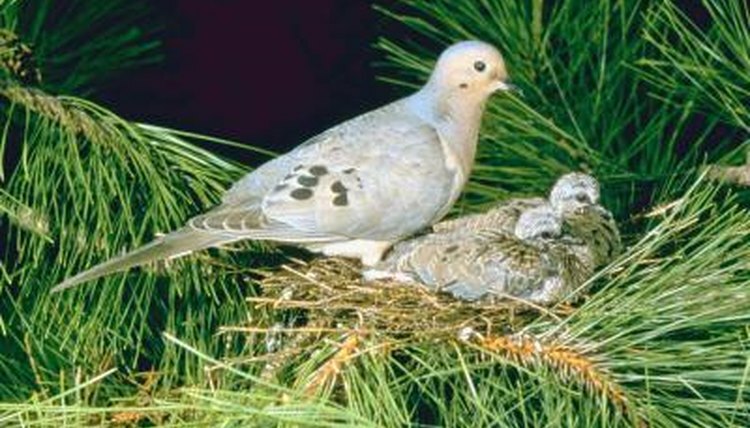 Doves are ground-feeding birds that primarily consume seeds. Attract them to your yard by scattering millet, sunflower and safflower seed on the ground in open places. Alternatively, you can use platform feeders placed close to the ground to contain the seed. Doves -- and other birds that spend a lot of time foraging on the ground -- are especially vulnerable to house cats and other predators; keep all pets indoors when trying to attract them. While their feeding areas must be in open spaces, they will use nearby trees and shrubs for nesting.